You can instantly get double eyelids. This will make your eyes appear bigger and beautiful. The trend of getting double eyelids is gaining grounds in young girls. This makes their appearance bigger than they are naturally. Getting double eyelids is more to technique than the make-up. If you have not tried before how to get double eyelids, do this time to see how you look in bigger eyes on a beautiful face. The impact can be without even full facial make-up. Make sure you have a tape, a basic element of getting eyelids double quickly. If you do not have tape, first buy it from your nearest store. The best place is your local pharmacy. 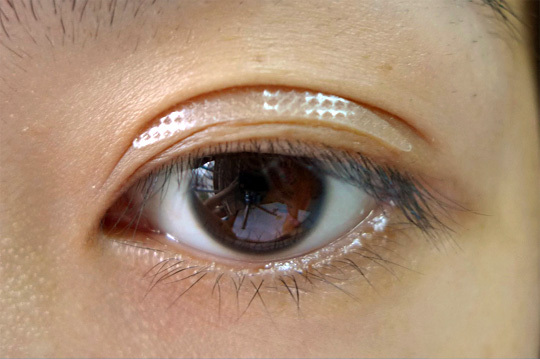 Generally, tapes come with pre-cut pieces, but since every girl has a different size of eyes, they can be adjusted according to the eye length. Cut the tape up to the length and width you want. This should match your eye length. The most recommended method is to cut the tape for about a centimetre and place on the top of your eyelids to the place you want to create your eyelids. Next thing you should have is eye glue to fix the tape on the eyelids to make them appear double. Make sure you only choose the eye glue as using any other adhesive is risky, since it will be very difficult to remove. You can buy an eye glue from your local pharmacy or drug store. Position the cut pieces of the tape carefully on the eyelids and glue them with the eye glue. Make sure that the person next to you cannot guess that you have done the double eyelids yourself and that it is not natural. This will depend on the level of your efficiency. You might have some problems for the first time, but a bit of extra effort can help you get the job done perfectly. Another option for you to get quicker and permanent double eyelids is surgery. The option has become very popular in the Asian countries, and the cost of surgery has become more affordable. So you can try this option as well, or otherwise stick to the taping option, which will require you to do double eyelids whenever you want.